At the heart of LASS’s sound are Real Legato performance sample patches and a unique “layered ensemble” approach. These ensembles were all recorded individually in a large film sc oring studio. Because they’re made up of different players (avoiding the dreaded “same player” sound), they combine seamlessly to produce entirely cohesive small, medium, or large sections with the right divisi ratios. 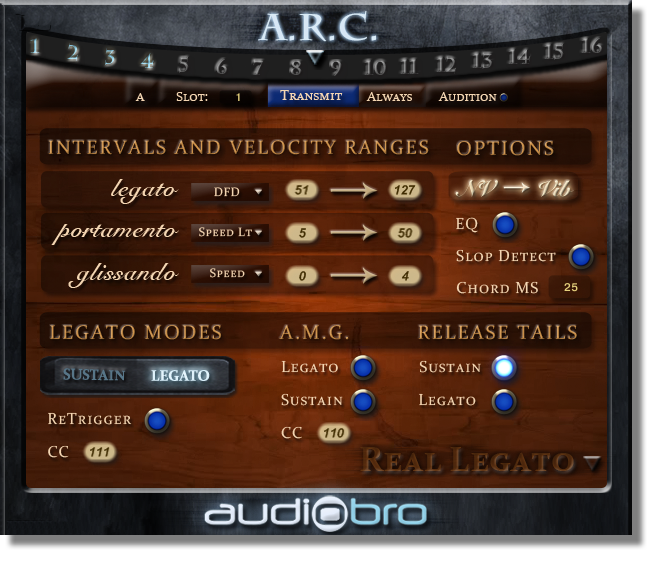 The Real Legato page (as well as other pages like A.R.T., AA & DNH and Tuning pages etc) are considered Remote Control pages insofar as they help you program or modify the patches to your liking remotely from the ARC. All the controls reflect what is already available on the patches. Furthermore, you can batch Load/Purge the different legato, portamento and glissando samples from your patches’ RAM… as well as set the playback engine from DFD mode (Direct from Disk) to Sample mode without ever having to go into the patch editors. Simply make your changes and click on the Transmit button for all the patches on the selected MIDI channels to adopt your changes.